Inside the sleek and modernized clinics of Turkey, the greatest hair transplant doctors in the world are offering proven and permanent solutions to hair loss for men and women. VisitandCare.com reports earnings for these Turkish doctors jumped to $3.4M, from a year earlier. The exclusive hair transplant centers in Turkey provide a sweeping assemblage of technology–fueled innovations — which has further progressed the hair transplant industry. The omniscience of Turkish hair loss clinics creates stunning, natural looking results — at affordable costs. With steadily climbing rates, statistical proof indicates that Turkey is the sixth most visited country in the world for medical tourism, according to the Ministry of Health. Over 30 million individuals visited the country last year alone for surgical procedures — from hair transplants and plastic surgery to cancer care and orthopedic surgery. “We are excited to connect patients to some of the best hair loss surgeons in the world. Our Turkish providers create results that are flawless, and the detail and artistry is incredible. The future of the hair transplantation industry is bright in Turkey, and we are ecstatic that we are at the very center of it,” explained Tolga Umar, CEO and Founder of VisitandCare.com. Hair transplant surgeons in Turkey not only explore and continually study the causes of hair loss, but also help patients through the psychological process, and provide expert diagnosis and treatment options. Hair restoration in Turkey, particularly in Ankara and Istanbul, consistently attracts patients traveling from Middle Eastern countries such as, Saudi Arabia, UAE, Libya, and Lebanon and regularly brings patients from the UK, Germany, and the Netherlands. “The hair transplant industry is rapidly progressing. Within the last few years, patients traveling to Turkey are encouraged by up-to-date techniques and affordable treatments, in conveniently located clinics, which is broadening the responsiveness to hair restoration in Turkey,” stated Mr. Umar. 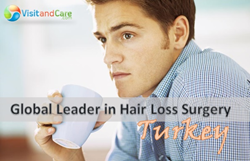 With hair transplant methods that are unfailingly changing the industry landscape, Turkey continues to roll out stimulating new procedures that will transform the lives of hair loss patients around the globe. VisitandCare.com looks to help providers achieve a significant rise in revenue in 2014 — to $8M or more — reaching an annual sales target three years ahead of schedule. VisitandCare.com was created to give individuals worldwide valued direction locating a doctor, obtain free medical treatment quotes, and uncover affordable medical treatments at destinations of their choice. Improving Patients Lives |The company provides access to exclusive doctors and hospitals who specialize in infertility, plastic surgery, cosmetic dentistry, laser eye surgery, orthopedic surgery, hair transplantation, weight loss surgery, heart surgery and cancer care. Patients are matched with devoted multilingual patient facilitators and provided tangible connections to doctors worldwide. Promoting Your Healthcare Brand | For the ultimate connection between the healthcare industry and patients worldwide, the company delivers an unrivaled commitment to create sustained value for medical partners. Contact VisitandCare.com to see if you are eligible to become a partner of the exclusive network.